The integration of drones into society has attracted unprecedented attention throughout the world. The change, for aviation, has been described as being equally as big as the arrival of the jet engine. This book examines the issues that surround this change, for our society and the legal frameworks that preserve our way of life. Drones in Society takes the uninitiated on a journey to understand the history of drones, the present day and the potential future in order to demystify the media hype. 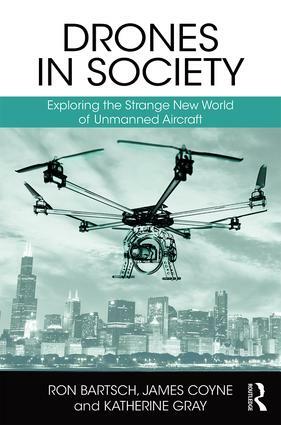 Written in an accessible style, Drones in Society will appeal to a broad range of interested readerships, among them students, safety regulators, government employees, airspace regulators, insurance brokers and underwriters, risk managers, lawyers, privacy groups and the Remotely Piloted Aircraft System (RPAS) industry generally. In a world first, this book is a light and interesting read; being both relatable and memorable while discussing complex matters of privacy, international law and the challenges ahead for us all. "Each author is an expert in UASs. Lead author, Ron Bartsch, has worked in the aviation industry for more than 30 years and is a former director of the Australian Association of Unmanned Systems. This is reflected in the fascinating detail they provide about the technology’s development and its end-use applications…A well written book, it provides an accurate account of the good, bad and ugly uses for UASs." Ron Bartsch has over 30 years’ experience in the aviation industry in a variety of senior operational, safety and regulatory roles. Ron is President of the Asia Pacific RPAS Consortium and is a former Director of the Australian Association of Unmanned Systems (AAUS) and recently completed his thesis on the legal aspects of RPAS operations with the University of Sydney. As former Head of Safety and Regulatory Compliance at Qantas Airways Limited and a senior manager with the Australian Civil Aviation Safety Authority, Ron has operational, safety and regulatory experience across all sectors of the aviation industry. Ron is also a presiding member of the Administrative Appeals Tribunal as an aviation specialist. James Coyne is a former Civil Aviation Safety Authority senior manager and the former Co-chair of the International Civil Aviation Organisation Unmanned Aircraft Systems Study Group. He is currently the Technical Director of UAS International. Jim holds a BEng with Honours and an MSc in Aero-systems Engineering. He also serves on the Board of the Australian Association of Unmanned Systems. Katherine Gray has over 20 years’ experience as a regulator, lead auditor and project manager. She has a strong aviation background and a keen interest in human factors. Katherine is the Senior Associate of UAS International, the primary independent unmanned aircraft systems (UAS) accreditor in the Asia Pacific region. She holds a BEng in Aerospace Engineering and an MBA.